MEXICO CITY, Mexico, September 20, 2017 (ENS) – A deadly earthquake struck Mexico on Tuesday afternoon, sending buildings crashing to the ground, killing children in their collapsing school, cracking highways, rocking the capital and sending thousands of people into the streets for the second time in two weeks. The epicenter of Tuesday’s 7.1 earthquake was located near the Puebla state town of Raboso, about 76 miles (120 kilometers) southeast of Mexico City. Tuesday’s earthquake came just 10 days after a magnitude-8.1 earthquake struck off the southern coast of the country, killing at least 90 people, according to the governor of the hard-hit state of Oaxaca. Although the first quake on September 8 was stronger, the one Tuesday was closer to Mexico City, causing more damage in the capital and terrifying its nearly nine million residents. 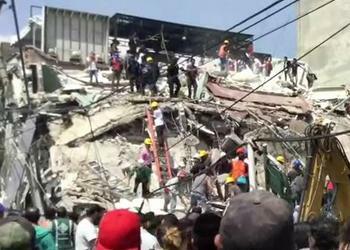 Mexico’s federal public safety office has confirmed that 225 people lost their lives in the quake. Civil Protection director Luis Felipe Puente said this morning that 94 lost their lives in Mexico City, 71 in Morelos, 43 in Puebla, 12 in Mexico state, four in Guerrero and one in Oaxaca. Search and rescue crews found the bodies of 21 children and four adults in the rubble of an elementary school that collapsed during the earthquake in Mexico City, said Puente. One child was pulled alive from the rubble, but at least 30 children were still missing Tuesday night, the president said. “We are facing a new national emergency,” Peña Nieto told citizens. Rescue efforts continue today in Mexico City, where people are still trapped in the rubble of fallen buildings. In addition to police and military search and rescue teams, dozens of Mexican Red Cross teams are searching for survivors, transporting the injured to hospitals and providing first aid on the scene. The Mexican Red Cross has deployed dozens of doctors and nurses, alongside more than 90 ambulances and its urban rescue unit. More than 500 volunteers and employees were activated in the hours immediately following the quake. In addition, 17 more urban rescue units, ambulances and logistic units will arrive today. Rescue workers have pulled 45 people out of the wreckage of the 45 buildings that have collapsed all across Mexico City, and another 500 need to be inspected by safety officials, Mayor Miguel Ángel Mancera said this morning. According to the education secretary, 2,224 schools in 10 states have been damaged. Puebla Governor Antonio Gali Fayad said Atzala was the municipality worst hit in his state, with 11 victims as of late Tuesday. All were among 30 people attending a baptism at the church of Santiago Apóstol, and were buried in the debris when church’s dome collapsed. In Guerrero state, Governor Héctor Astudillo said the cities of Atenango del Río, Huitzuco, Tepecocuilco and Copalillo are the worst affected by the earthquake. The National Seismological Service reported that there had been 23 aftershocks as of 5:00 am today, the strongest being 4.0 on the Richter scale. Jaime Hernández, head of the Federal Electricity Commission, says that in total 4.8 million homes and businesses experienced power outages due to the quake. Hernández says that as of 7:00 am power had been restored to 85 percent of the 1.8 million customers in Mexico City who lost service in the earthquake. 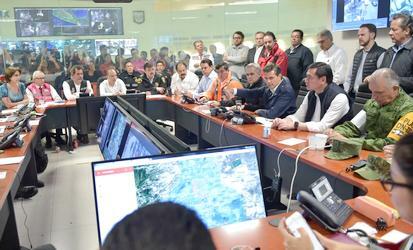 Service has been 90 percent restored in Morelos and 95 percent in the state of Mexico. Electricity has been fully restored in Puebla, Oaxaca, Guerrero and Tlaxcala.